Certified in personal training, sports nutrition, and group training. 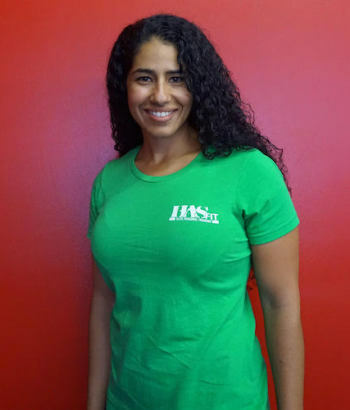 Specializes in weight loss, strength training, and flexibility. Has been in the fitness industry for six years working with men, women, adolescence, and children. Fitness and health became a huge part of my life about ten years ago. It came to me when I was the heaviest that I had ever been outside of maternity. Honestly speaking I spent a great deal of my life unhappy with my physical appearance. I began to develop at a very young age so I didn’t fit in with the other girls. I was considered fat. The careless words spoken to me by others help start an eleven year battle with eating disorders. I’ve been obese and anorexic but also healthy and completely fit. When I became twenty-nine, I began to workout once again. After joining my son on a diet that his pediatrician put him on, we began to lose weight. Then I began to walk for exercise and that turned into running. In order to avoid injury, I began taking Body Pump classes. I eventually began taking other classes along with my 3 mile jogs five days per week. Then I got serious about nutrition. After about 2 years, I was the fittest that I had ever been in my life. The fear of regaining the weight turned my enjoyment of working out and nutrition into an illness. I began to exercise two to four hours per day and eating as little as 1100 calories. I became anorexic. After a few friends from the gym pointing out my situation, and me finally accepting it, I tearfully prayed for God to help me on the way to the gym one morning. I was tired of counting every single calorie. God did help me. He helped me get over the calorie counting and my focus on my weight. I receive a call from my cousin. She wanted to start working out with me. Her doctor told her that she needed to lose weight or she would become diabetic. We began to work out together and I taught her all the right things to do as far as her nutrition and how to properly weight train with cardio. After six months she had lost a little more than forty pounds. Everyone began to encourage me to become a personal trainer. I was so inspired that I decided to go to school. I have been teaching group classes since 2010 and personal training for four years. I love to experience every type of training there is and love researching nutrition and fitness information. My goal is to help every client reach their personal health and fitness goals. I incorporate everything from strength training to yoga and boxing in my training. I am a mother of two wonderful teenagers. I rock climb, wake surf, snowboard, and love to work out. My name is Rosa Albright and I would love to help you reach your health and fitness potential.